At a symposium next month (15 September 2017) academics, artists and ornithologists will share their responses to the work of 19th-century poet John Clare, whose patient and accurate observations of birds in field and hedgerow continue to astonish and inspire. Clare’s greatest achievement is the conjunction of scientific accuracy with what he calls ‘poetic feeling’. He possesses a depth of knowledge only achievable by painstaking observation of birds’ behaviour as it changes with the seasons. The poet John Clare (1793-1864) was a keen natural historian who knew the countryside in all its moods. His various jobs saw him labouring in farms and gardens; his gravestone remembers him as the ‘peasant poet’. Best known for his verse, Clare also wrote prose accounts of the plants and animals he observed in his native Northamptonshire. In a foreword to the anthology, The Poetry of Birds, broadcaster and bird watcher Tim Dee notes that Clare wrote about 147 species of British wild birds “without any technical kit whatsoever”. His records contain 65 first descriptions of birds for Northamptonshire alone. The term ‘nature writing’ had yet to be coined in the early 1800s – but Clare was undoubtedly ahead of his time in the way that he wove his detailed observations of the natural world into his writing. Dee is one of the speakers who will be talking about ‘Clare and the Art of Bird Watching’ at a symposium held on September 15, 2017 at the David Attenborough Building. The event is a collaboration between the Centre for John Clare Studies (English Faculty) and the Cambridge Conservation Initiative (CCI), itself a partnership between Cambridge University and a cluster of conservation organisations. The symposium will bring together literary scholars with ornithologists, nature writers and artists to consider what it means to observe and record birds. How, for example, does Clare look and watch, and how does he translate what he observes into words? How do today’s artists and writers respond to his work? “The idea is to raise questions about the act of bird watching, recording, understanding and classification, both in the early 19th century and the present day, dwelling in particular on the importance of localism and the distinctiveness of Clare’s environment and voice to his writing about birds,” says Dr Sarah Houghton-Walker from the Centre for John Clare Studies. Academics speaking at the symposium include Dr Francesca MacKenney (Bristol), Dr Mina Gorji (Cambridge) and Dr Jos Smith (University of East Anglia). Participants will also hear from printmaker Carry Akroyd, textile artist Anita Bruce, and nature writers Alex Preston and Derek Niemann. Birds soar through the lines of English poetry, but for Clare’s contemporaries they played an especially important symbolic role. “Shelley’s skylark is transcendentally a spirit. Keats’ nightingale is significant because it represents a sublime kind of not-knowing,” says Houghton-Walker. Clare, however, insists on the real and the particular. He knows exactly how and where the birds he writes about nest; he knows how many eggs those birds lay; and he leaves behind a meticulous record of every detail, right down to the appearance of the markings on each egg. “He’s intensely interested in habitat, behaviour and song, but also, increasingly, in the threats to birds from his fellow men. He insists on a vital accuracy in his descriptions which continue to astonish scientific natural historians, and yet produces poetry about birds which can claim to be some of the very best in the language,” says Houghton-Walker. “Clare’s greatest achievement is the conjunction of scientific accuracy with what he calls ‘poetic feeling’. He possesses a depth of knowledge only achievable by painstaking observation of birds’ behaviour as it changes with the seasons. He scorns those poets who don’t take the time to watch and merely recycle, often inaccurate, poetic conventions. A determination to represent nature accurately led to struggles, too. Voicing his frustration at his inability adequately to transcribe the song of the nightingale, Clare wrote that “many of her notes are sounds that cannot be written the alphabet having no letters that can syllable the sounds”. Without binoculars and with nothing but his senses to rely on, Clare gave us some of the most compelling nature writing of the 19th century. To illustrate some of the wonders of birds and their behaviour, the symposium will include a screening of ‘Murmuration X 10’, a short film by filmmaker Sarah Wood and Helen Macdonald, author of H is for Hawk, and a guided tour of the avian collection at the Museum of Zoology. For more details and to book a place at the symposium ‘Clare and the Art of Bird Watching’ click here. 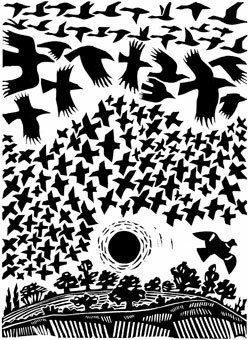 Inset image: Carry Akroyd's ‘Evening Crows’ linocut illustration from 'This Happy Spirit’.